The Spidertrax Blog » Should a Rear Sway Bar Be Mounted Behind the Rear Axle? Home > The Rock Bug	> Should a Rear Sway Bar Be Mounted Behind the Rear Axle? Should a Rear Sway Bar Be Mounted Behind the Rear Axle? A picture of the Rock Bug sway bar mounted in front of the rear axle. A few months back, a client came into our shop and asked a very thought provoking question. Does it matter if the rear sway bar is mounted in front of the rear axle or behind the rear axle? The understanding by the client was that placing the rear sway bar closer to the front suspension (in front of the rear axle) would have a greater negative effect on the front suspension then mounting it further away (behind the rear axle). Is this really the case? I have always struggled with this as I couldn’t see how placing the sway bar in front or behind the axle mattered in terms of effecting of the opposing suspension. So, I figured I would break out the old engineering paper and geek out a bit with a few static diagrams to help better understand what’s going on. Disclaimer – The purpose of this blog post is only to draw attention to the problem and create a good platform for debate. I am in no way taking a position of authority on this problem and am only looking to better understand the question myself. The static diagram below starts with a force (Fi) on the passenger sway bar and follows the effect of Fi through the passenger sway bar, the bar itself, and the driver sway bar with Wd and Wp representing the weight of the axle. In the end, the static diagram shows the net effect on the chassis as a resulting Moment (Mv1y) with vertical forces Fd2z and Fp1z and moments Md2x and Mp1x being equal and opposite. Therefore, according to this static diagram above, mounting the rear sway bar in front of the rear axle should have the same effects on the front suspension as mounting the rear sway bar behind the rear axle as the Moment (Mv1y) would be the same with all other vertical forces (Fd2z & Fp1z) and moments (Md2x & Mp1x) cancelling each other out. Your thoughts are encouraged here so please leave your comments for all to see, read, and digest. As always, I am happy to be both challenged and corrected on any issue and look forward to updating this blog entry with more details as they are presented. UPDATE [17-Dec-2009] – How About the Sway Bar’s Position in the Vertical Plane? The above analysis focuses on a sway bar’s effect in the horizontal plane (front & back) and takes the position that in this plane, the effectiveness of moment Mv1y is equal along the entire x-axis. Thanks to an awesome thread on Pirate4x4, another great question came up, one that I have never considered prior to hearing it. Does it matter where the sway bar is mounted along the vertical axis (up & down). After studying this question myself, I have to take the side of yes it absolutely matters. 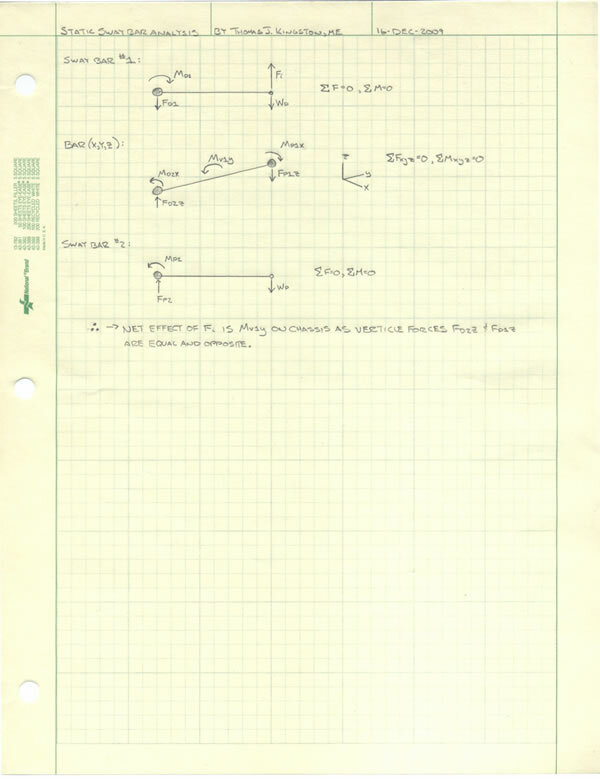 Grabbing the same old engineering paper once again, here is a static diagram looking at the forces on the bar in relation to the vehicle’s roll center (detailed toward the bottom of the paper). In terms of effectiveness, the position of the sway bar in relation to the vehicles roll center along this vertical plane does matter. What is so interesting about this case is it would be easy to assume that whatever ineffectiveness the sway bar has can be overcome by simply installing a heaver sway bar. Although this is true, larger diameter sway bars result in a smaller allowable angles of deflection (how much twist the bar has before it yields). Therefore, if you are building a multi-purpose rock crawler / rock racer, it very well may be best to position the sway bar as close to in-line with the vehicle’s roll center as possible in this vertical plane. Thoughts?